Twenty-five-year-old Kuldip Singh from Bhogpur near Jalandhar is a classic case of how the policies for the welfare of Scheduled Caste (SC) students never reach them and are restricted to the creamy layer. 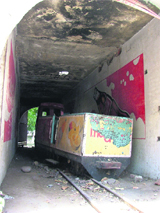 The toy train at Rakh Bagh is in a shambles. A famous attraction for children once, the train is out of order since 2005. However, officials of the Ludhiana Municipal Corporation had been claming that the toy train was being repaired and would operational soon. The MC officials now claim that the project is in a shambles as the state tourism department is developing Rakh Bagh and till the time this project is complete, they would not be able to start the toy train. In view of the forthcoming tax return season, the Income Tax department for the first time has decided to set up special ‘tax kiosks’ in residential areas for facilitating taxpayers. These kiosks will deal with a host of taxpayer related queries as the time of paying the annual income tax return draws near. Two more suspected cases of dengue have been reported in Dayanand Medical College and Hospital (DMCH) here today. However, none of these cases are from Ludhiana. Soon, 30 new low-floor buses will run on city roads under the City Bus Service project. These buses will run on five new routes, which will be finalised after a meeting of the board of directors. These buses will be part of the 40 buses to be purchased from Tata under the Jawaharlal Nehru National Urban Renewal Mission (JNNURM) project. 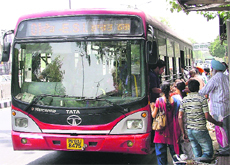 The Ludhiana City Bus Service Ltd has already taken delivery of 10 buses while the final batch of 30 buses is expected to reach the city in the next 15 days. On the first day of schools after summer vacations, government senior secondary schools of the city witnessed thin attendance. The school authorities said only 50 per cent students attended the schools after one-month-long summer holidays. The students from classes VI to X were comparatively more absent as compared to senior secondary classes. “Health is wealth but reverse cannot be true. Sadly, focus of most of the people is on wealth nowadays and that is creating problems,” these remarks were made by former additional director-general, Indian Council of Agricultural Research, Dr RP Kachru, during the inaugural of ICAR-sponsored 21-day summer training on “Newer concepts and techniques in development of health foods”, organised by the food grains and oilseeds processing division at the Central Institute of Post Harvest Engineering and Technology (CIPHET) here today. Students of the Khalsa College for Women (KCW) have brought laurels to the college by their excellent performance in BSc-III biotechnology (honours), the results of which were declared by Panjab University. A postman, identified as Vijay Kumar, a resident of Kot-Badal Khan village, died on the spot when a speeding Maruti car hit his scooter near Sagarpur village in PS Phillaur last evening. The accident took place when he was returning home. The Punjab Pradesh Beopar Mandal is up in arms against the excise and taxation department, Punjab, for issuing recent orders in which excise and taxation officials (ETOs) and excise and taxation inspectors (ETIs) have been asked to authenticate all bill books of dealers, especially those who were dealing in 12.5 per cent tax items. A day in the scorching heat and night without regular electricity is the fate that every resident of the city has been facing these days. Power cuts are becoming an integral part of the life of the residents these days and Punjab State Power Corporation Limited (PSPCL) has not decided any timing for power cuts. The PSPCL is officially imposing three hours of power cuts in the city, but it is observed that power cuts continue from more than the declared timings, which is making life of the residents miserable. A 40-year-old man has been feared drowned in Sidhwan Canal while trying to save his 10-year-old son here today. The victim has been identified as Hemraj, a daily-wage earner and a resident of Sunet village. High drama was witnessed at a bank located near Samrala Chowk when a city-based cloth merchant claimed that his gold ornaments weighing 500 grams (50 tolas) kept in a bank locker was missing. It has been long when Ludhiana was called the Mercedes capital. But now it is not just Mercedes, but a variety of luxury car brands that can be seen on the city roads. These luxury cars have become so ubiquitous that these no longer draw eyeballs and make onlookers curious. The city truly seems to be becoming a name synonymous with the luxury cars now. Looking at flowers and foliage, planted in a conventional manner do not interest her, for she imagines accompanying containers, embracing these blooms, to be as vibrant and interesting. 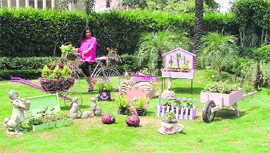 Sunita Singal, a resident of Ludhiana, doesn't feel any boundaries when it comes to fashioning the containers for plants and flowers in a garden. The portion of the old GT Road near the Clock Tower, which had caved in April, has finally been repaired by the Ludhiana Municipal Corporation staff. The MC officials, who were overseeing the repair work, which has been going on at a snail's pace, have got a lentil constructed on the road. They plan to open the road for vehicular traffic in the next two weeks. The Jagraon Municipal Council seems to have learnt no lesson from the past incidents of people losing their lives after falling in uncovered wholes in different parts of the country. A number of manholes across the town are still uncovered. Ludhianvis, who are known for spending their vacations in style, will now have to loosen their purse strings for planning trips abroad since air tickets and overseas holiday packages bought from online portals would attract service tax in the wake of the new service tax regime coming into effect from July 1. The Ludhiana Builders Association has taken serious note of the rising prices of building material due to the ongoing ban imposed on mining. The members of the association want that state government should intervene in the matter as construction activity has come to a halt in the state. Heatwave continues and simultaneously the prices of vegetables are going up. Owing to intense heat wave, vegetables perish the next day. So wholesalers buy only a limited stock of vegetables. "Gone are the days when cauliflower and bottle gourd were available at a price of Rs 2 or 5 per kg. Today, nothing is priced below Rs 20 per kg. Even potato is old at Rs 15 per kg,” said a vegetable seller at Agar Nagar. There seem to be no end to snatching incidents in the city as three armed assailants riding a motorcycle snatched Rs 1.5 lakh from a couple in Gopal Nagar. The incident took place last evening when Laxman Gupta of Tibba Road was returning home on a motorcycle along with his wife after a land deal at Transport Nagar. With the arrest of two persons, the CIA staff of the Jagraon police claims to have busted an interstate gang of smugglers who used to supply opium to its customers on demand. The police has arrested Suresh Vyas, a resident of Dehbaria in Rajasthan, and Roor Singh of Saakria in the same state, and recovered 2 kg of opium from their possession. Thieves struck at a house of a business man at Rishi Nagar and decamped with gold jewellery worth lakhs. The house belongs to Rajiv Kapila, who has gone on a Europe tour along with his family. Drug Inspector Sukhbeer Chand has said habit-forming drugs worth Rs 7,000 were sized from Janta Medical Hall, Dhuri Line, yesterday. Ludhiana gained first innings lead of 45 runs and then declared their second innings on 317 runs against Patiala on the third day of the four-day match of the Punjab State Inter District Cricket Tournament (u-22) being organised by the Punjab Cricket Association on the Punjab Agricultural University campus here today.